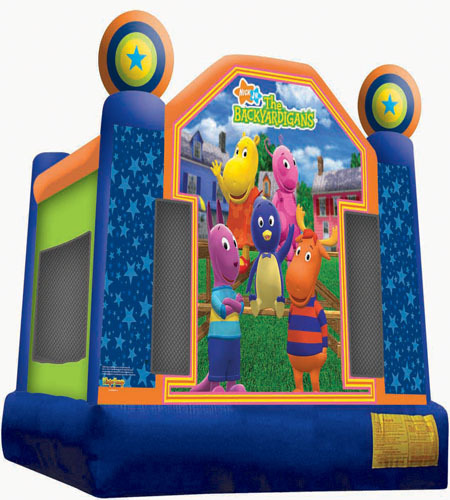 DESCRIPTION: This licensed Backyardigans bouncer captures the younger crowd's attention with a spacious jumping area for bouncing all afternoon! Kids can experience this bounce house's artwork of Austin, Uniqua, Pablo, Tyrone, and Tasha taking part in their own backyard party. The duo of star-topped towers ties into the brightly-colored theme, grabbing the attention of passersby and inviting little imaginations to take a Backyardigans adventure. Participants can sing and dance with their favorite characters, captivating many onlookers at your event. Entrance safety ramp and basketball hoop inside included! How Many Kids Will This Unit Hold? The Backyardigans Bouncer will hold up to 8 kids, not to exceed 800 pounds at any one time.